HBO created a music festival that connected fans with the stars of the show. Before Season 3 of HBO’s Insecure debuted on Aug. 12, the marketing team wanted to score some major buzz for the show. Especially considering Season 2 averaged 1.5 million viewers in live-plus-7 ratings, per Nielsen, thanks in part to the halo effect of its Game of Thrones lead-in, which it didn’t have this year. But even without help from the Thrones juggernaut, the show is averaging 1.1 million viewers per episode so far this year—a big increase from Season 1’s 0.6 million average—and received a quick renewal for Season 4, thanks in part to a massive marketing effort that included a number of large-scale events and social media pushes. Music plays a major role in the series, so HBO incorporated live music as a tenet of the show’s marketing. 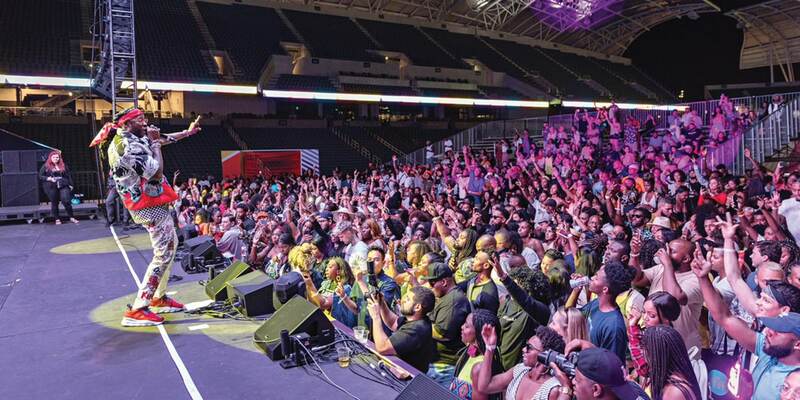 HBO’s multicultural marketing team wanted to raise the bar on past efforts, which included a block party last year in Inglewood, Calif., and in Brooklyn the year prior. In July, the team took over the new Banc of California Stadium, home to the Los Angeles Football Club, for a carnival-themed music festival with partners Spotify, Teen Vogue and Hypebeast. Inside the soccer stadium, HBO hosted over 2,500 influencers, cast members and other guests with live performances by Saweetie, Rico Nasty, Aminé and 2 Chainz. The artists, who are featured on the Season 3 soundtrack, performed unreleased tracks for attendees. The event had bouncy castles, food, games and a screening of the Season 3 premiere with introductions from the cast members. Outside of InsecureFest, HBO created the Insecure Adulting Pop Up in NYC in partnership with CoverGirl, Entertainment Weekly and Tidal. That event came complete with a “Rappin’ Ain’t Easy” karaoke booth modeled after character Issa Dee’s bathroom on the show and a “Prizes Ain’t Easy” claw machine filled with Insecure-branded bears and gift cards. The team also had a special viewing party in partnership with Twitter for some live tweeting and Q&A with talent from the show, as well as a special screening at the Martha’s Vineyard African American Film Festival and another in partnership with Afropunk. Insecure creator and star Issa Rae herself praised the multicultural marketing team for its work. HBO wanted something bigger than its previous events, but it needed to feel authentic to the show and Rae’s vision. “We wanted people to feel that they could experience Insecure in every way, so there’s music, food, there were rides, slides, all within the themes of the show,” Martinez said. HBO’s multicultural marketing team wanted to create an integrated campaign that would reengage viewers and drive awareness for them to tune in each week. HBO targeted black males, as the show is already the largest African-American-skewing show on HBO, with half its audience consisting of African Americans. Before planning the events, Martinez and her team met with Insecure’s showrunners to get a rundown on the upcoming season’s storylines. The team tailored its experiential events to those themes—for InsecureFest, the team wanted a location like L.A.’s new soccer stadium that would truly blow people away.